-"A new spot on the ground floor of newly renovated Standard Hotel in East Village"--would usually attract the certain types of clientele, especially non New Yorkers who seem to have been on the Millionaire Matchmakers several times. However, Narcissa is something more than a "scene." -Warm, inviting staff ensures that you are comfortable with quality service. -With wooden tables and open kitchen, it is quite casual and humble, which is really the real, current trend, isn't it? -Dovetail's Michelin starred chef, John Fraser, creates a unique, many vegetable focused dishes. 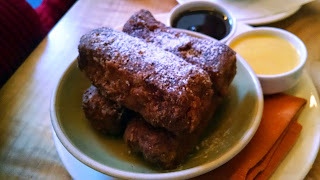 -"French Toast Bites" ($7) is a must for brunch. 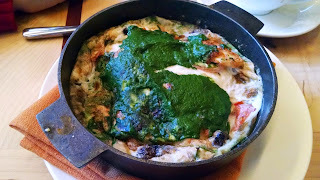 -"Egg White Frittata" ($15, spinach, shiitake, fontina, tomatoes) is excellent and flavorful but a bit overdone. -"Skillet Burger" ($18, guacamole, manchego, watercress) is large and flavorful, if not a bit too messy for such a nice environment.